The Notebook, which from what I recall from my single viewing roughly ten years ago was not a great film, has apparently been made even less great thanks to Netflix UK, which went ahead and changed the ending to something less tearjerky. Can they…do that? The original denouement reveals (spoiler alert? Do I need to say this?) 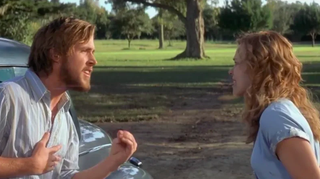 the film’s once youthful main characters, Noah and Allie, who have aged out of being Ryan Gosling and Rachel McAdams and into James Garner and Gena Rowlands. Allie is stricken with dementia and living in a retirement home. She no longer remembers the love she once shared with Noah, but he makes it dogged mission to remind her. Eventually, their romance does come back to her, but not for long—the two end up dying, hand in hand in bed. Netflix decided that was too much for its British audience, and cut the ending and replaced it with a shot of a flock of birds flying over a lake. If this was meant to represent the souls of Noah and Allie soaring toward the heavens, fans are NOT having it. Fair. One thing I do remember from my single viewing was the distinct feeling that my tears had been manipulated out of me; that much like being tickled, my physiological response was entirely involuntary but also perfectly calibrated for maximal weeping. I would hate to sit down ready to move some tears and find out that the ending I’d been awaiting had been scrapped. I felt the same way when I found out that they’d swapped out Chingy’s “Right Thurr” from the opening shot of the first episode of Skins. I’m still livid. Anyway, full disclosure: I had no idea that The Notebook ended with the two dying together. I could have sworn Allie got hit by a bus! Huh.